The estranged half-sister of Duchess Meghan took to Twitter over the weekend to send her new brother-in-law a rather sarcastic message for his 34th birthday on Saturday. In a tweet from her private account, Samantha criticised Harry for allegedly failing to contact her father for his birthday back in July. “Happy Birthday Harry! 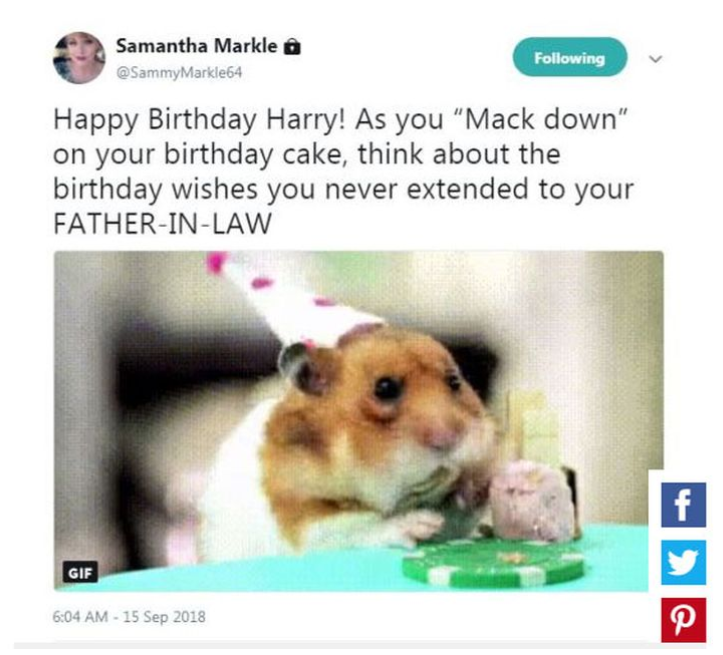 As you ‘mack down’ on your birthday cake, think about the birthday wishes you never extended to your FATHER-IN-LAW,” she wrote. The post was accompanied by a gif of a ginger hamster wearing a party hat and nibbling on a piece of cake. It’s not the first time Samantha has used social media to troll the royal family, with the 53-year-old often taking swipes at the couple online. “I am not candy coating anything anymore! The DUCHASS should be human to our father who has given her everything. He was the one who was there for her,” she tweeted just last week.